Take a richly-human story of survival and triumph, a now soundtrack by some of the hottest bands around and the startling, brooding presense of the 24-year old rock superstar Prince - the man who lived the music - and you've got Purple Rain, which according to Rolling Stone, "may be the smartest, most spiritually ambitious rock - 'n' - roll movie ever made." This turbulent, gutsy film sizzles and rocks in a way few rock films ever have. Hot-blooded Prince and his band The Revolution give electrifying performances of songs like the exhilarating "Let's Go Crazy," "I Would Die 4 U," the plaintive classic "When Doves Cry" and, of course, "Purple Rain" and other hits from his best-selling Warner Bros. Records soundtrack album of the same name. Hailed by Newsweek as "the new Prince of Hollywood." PRINCE and PURPLE RAIN will reign over rockdom for some time to come. 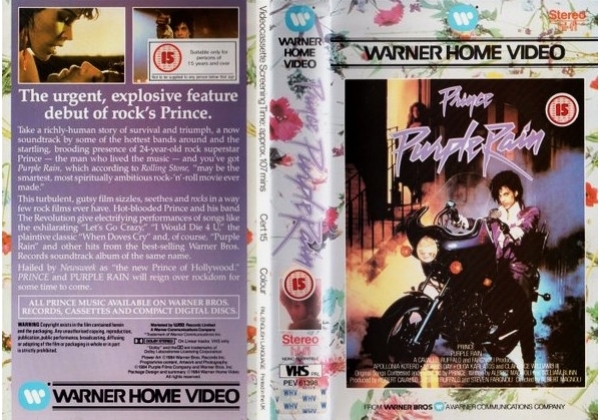 Or find "Purple Rain - Prince" on VHS and DVD / BluRay at Amazon.